During his study at the University of Houston Law Center, Mr. Amyx was a member of the Houston Journal of International Law and Student Bar Association. He interned for the Honorable Laura Carter Higley of the Texas First Court of Appeals and the Honorable Mike Engelhart of the 151st District Court of Harris County, and clerked for a prominent Houston securities fraud and compliance law firm. 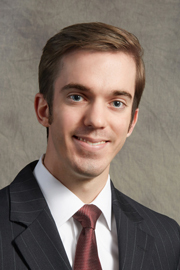 In his last year of law school, Mr. Amyx clerked for Mr. Lawrence Hanson and then in November 2014, accepted an associate attorney position with the firm. Mr. Amyx’s practice focuses on international trade, with an emphasis on import and export control issues. Mr. Amyx is an active member of the American Bar Association, Houston Bar Association, Houston Custom Broker and Freight Forwarder Association, and Houston Young Lawyer’s Association.